The fiscal year is coming to a close and poor Fork Parker has lost all his wonderful profit to greedy developers and their endless thirst for royalties! Grab a martini and ride your private helicopter to the snow capped mountains and hunt down the riches you so rightly deserve. Jump, dash, and repel your way up the sheer mountainside to scratch out a little profit and meet the demands of an increasingly angry board of directors! 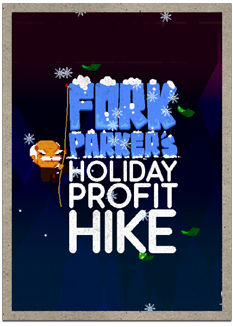 Fork Parker’s Holiday Profit Hike features snow, helicopters, ugly holiday sweaters, non-denominational penguins, a title screen, dope beats, ethics, torches, reverse monetization, hot tubs, non-candied canes, falling, ropes, and non-refundable holiday cheer.